Transparency into the most important decisions about the future of your faculty. A few big technology companies would have you believe that faculty hiring is just like staff hiring. But anyone involved in faculty affairs knows that’s just not true: tech built for hiring that doesn’t account for shared governance doesn’t factor in the nuances of committee decisions, confidential letters, and the submission of scholarly materials. Interfolio supports the academic requirements of faculty recruitment because it’s a tool built for all of the nuances of shared governance (and the requirements of HR). It provides powerful transparency into the talent, diversity, and accomplishments of your faculty population. Faculty recruit their peers with an array of online tools oriented to their responsibilities that make reviewing materials and narrowing large searches more efficient and fair. Search chairs rally their committees from a central platform on which to base all communication and committee logistics. Deans and administrators standardize criteria, messages to candidates, and job postings to create more equitable processes across the institution. EEO Officers benefit from near 100% compliance around diversity data with built-in EEO forms and reports that can be analyzed against each stage of the search. Senior administrators gain transparency and access to applicant data, including diversity information at each stage of the search and the outcomes of hiring decisions over time. Applicants receive a clear, professional, informative experience. Interested in the applicant experience? 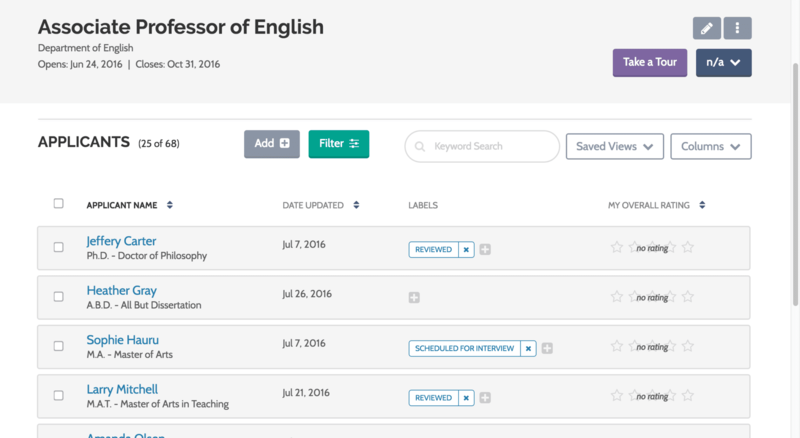 Check out what job applicants see when you use Interfolio to host your faculty search.